The piece that makes the GT4 really work is the 911 Carrera S sourced 3.8-liter flat-six engine. While the 991 Carrera S (pre-turbocharged version) pumps out 400 horsepower, Porsche didn’t quite want the Cayman GT4 to be faster than the Carrera S, so they detuned the engine down to 385 horses. However, because the Cayman GT4 is lighter from 0-60 mph it has the same time, 4.1 seconds, as the 2017 911 Carrera S in manual form (PDK is two tenths of a second faster). Beyond this, the GT4 is three tenths of a second faster than the base 2017 911 Carrera to 60 mph. Our friends over at SharkWerks thought this was good, but that there was still some room for improvement. They fitted a lightweight flywheel, a SharkWerks exhaust and changed the gearing. The six-speed transmission that comes with the Porsche Cayman GT4 is quite good, but many have thought that the gearing is too tall. That is great for the Autobahn where your speed limit is unrestricted for large sections, but here in the United States where most states don’t have speed limits allowing for legal speeds over 70 mph, it is overkill. The fact that you can hit 80 mph in second gear isn’t all that useful most of the time. Because of this SharkWerks has changed out some of the gears in the six-speed transmission. The result is a much more rewarding drive and when combined with the lightweight flywheel, it is perfect as you can rev the engine quickly. SharkWerks also fixed the rear visibility by raising the rear-wing. While this doesn’t sound like a big deal, they didn’t just get a taller wing from Japan on eBay. No, they had a custom forged wing spoiler produced that helps create downforce and mounts to the factory mounting points. It is also designed so it won’t fly away at speed. All of this adds up to a purpose built car that is more usable on the road, but still perfect for the track. The folks at SharkWerks where going for what Porsche might do if they were making a Cayman GT4 RS. We think that it is a stunning car that can be enjoyed on both the road and track. 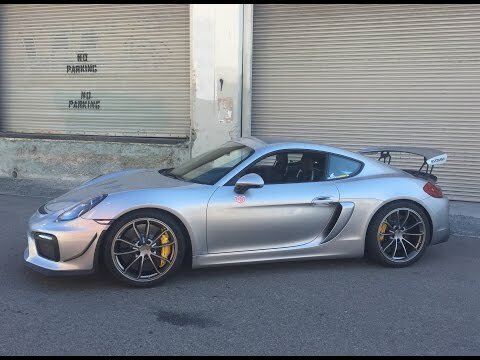 Check out the video below of our friends, Matt Farrah and Alex Ross taking the SharkWerks Porsche Cayman GT4 for a drive. After you watch the video and enjoy that exhaust note, scroll down to the comments and let us know what you think of the Cayman GT4 and the SharkWerks build.